Fast-paced, nail-biting sci-fi with a huge helping of self-deprecating humour. The Martian is easily one of the best sci-fi novels I have read this year. Given most people by now will have seen the movie trailer with Matt Damon I won’t dwell on the details of the plot. It is enough to know that the book centers around a man left behind on Mars, with little hope of survival or rescue. Despite the gloomy subject matter the thing I enjoyed most about The Martian was the humour. I laughed out loud dozens of times, and used up all my page markers highlighting hilarious quotes and paragraphs that made me giggle. Andy Weir so obviously took great pleasure in writing this novel, it is filled with a great sense of hope for the future, and joy in the potential for human ingenuity. The only drawback to this novel, that for me left it just shy of a perfect rating, was the last 3 or 4 pages. The soliloquy had none of the ‘spirit’ of the rest of the novel and felt like an awkward addition suggested by an editor who wanted to patch a plot oversight (it’s not enough to be considered a plot hole). 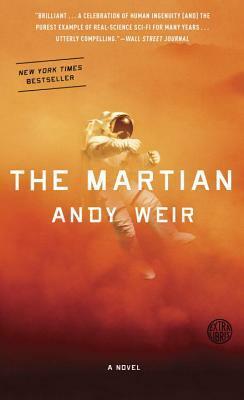 But overall The Martian is an excellent sci-fi novel, with terrific pacing, characters and humour. I would definitely recommend it for sci-fi fans and I can’t wait to see it adapted to the big-screen.